We love you. We loved you in the ’90s, and still remember everything you taught us in Fight Club. We loved you in that one Tim Burton movie you did – just kidding. 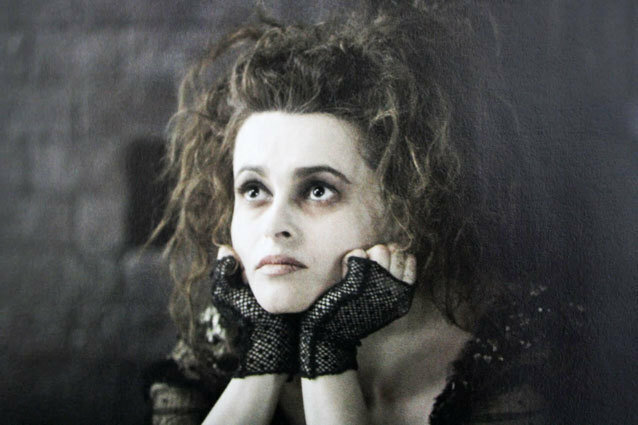 We loved you in the many, many, many Tim Burton movies you did…though nobody haunts our dreams like your Mrs. Lovett from Sweeney Todd: The Demon Barber of Fleet Street. The truth is, from The King’s Speech to Les Misérables, we’ve loved you in pretty much everything. And as we mentally prepare to watch your undoubtedly amazing performance as Elizabeth Taylor in the upcoming Burton and Taylor television movie, we celebrate just a handful of your best on-screen moments. Because we love you HBC. We absolutely love you. Seriously? Could anyone else pull off that laugh? We think not. Although our favorite line is a little too R-rated to actually share (it involved some mention of grade school and…er…sexual experiences therein), we all know and remember how awesome HBC was as Marla Singer. Mrs. Lovett, Sweeney Todd: The Demon Barber of Fleet Street. It’s okay — you know you want to be Mrs. Lovett for Halloween this year. There simply is nothing more frightening than a woman who decides to make people pies for a living. Only a brilliant thespian could take on the role of Mrs. Lovett, and then move on to play Queen Elizabeth in the Academy Award winner for Best Picture of the Year, The King’s Speech. Carter was also nominated for Best Supporting Actress for her amazing performance. Almost unrecognizable at first, Carter’s turn as the Red Queen in Tim Burton’s Alice In Wonderland was just…dope. People may have had mixed feelings about the adaptation, but few of us could get this image of the pinch-faced, screeching, evil Queen out of our heads. Plus…those eyebrows!